Though the report has generated some headlines – and no doubt stoked some fears regarding induced seismicity – it is important to understand that the study really offers nothing new to justify increased public concern. Regulators already had an understanding that wastewater injection can potentially trigger earthquakes from significant distances from injection zones prior to the study. More importantly, mitigation measures have already been implemented in top oil and gas producing regions that not only address the topline findings of this paper, but have also proven effective in further mitigating the already very small risk of induced seismicity from wastewater injection. Furthermore, one of the study’s co-authors admits that the study’s topline conclusion that basement rock injection may be safer than wastewater disposal into sedimentary rock “needs to be taken with a rather large grain of salt” for numerous practical reasons. North Dakota is a particularly interesting case study, considering the prevalence of wastewater disposal wells in a state that has become the second-largest oil producer in the United States. Oklahoma regulators have acknowledged that, “Seismicity can be induced at distances of 10 miles or more away from the injection point,” and have taken several regulatory measures to reduce wastewater injection in earthquake-prone areas. Those measures have produced tangible results over the past three years, as USGS data also show Oklahoma’s monthly average of M-2.8 or greater earthquakes at the midway point of 2018 was 76 percent below the monthly average in 2015. These declines have come even as oil production has surged to record levels in the Sooner State. Regulators in Texas – by far the United States’ top oil and gas producing state – have also already implemented regulations that largely address the 10-kilometer area of concern identified in this study. The Texas Railroad Commission debuted rules in 2014 that require operators to provide data on a roughly nine-kilometer radius from any proposed injection well in an area of historical seismicity. 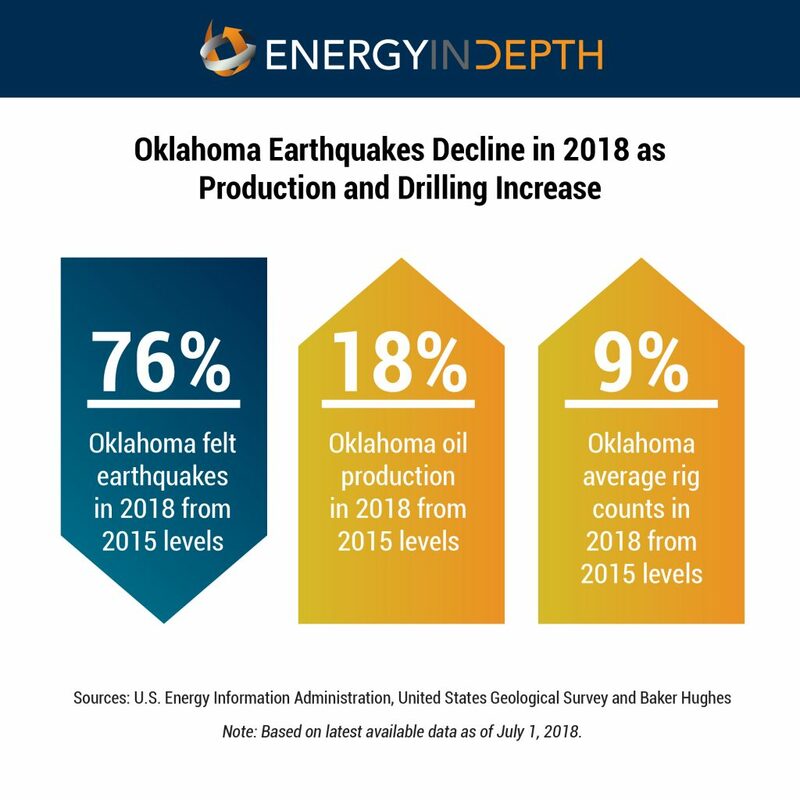 Collectively, the overall risk of induced seismic activity caused by wastewater injection is very low in the United States, while mitigation efforts in areas where suspected induced seismicity has been most concentrated – Oklahoma –have proven effective. As Oklahoma Geological Survey (OGS) director Jeremy Boak told Scientific American, highly permeable sedimentary rock takes in water “like a vacuum,” while basement rock lacks permeability, which explains why Boak explains “right now, probably no one is injecting into the basement” for both safety and storage capacity reasons. As Brodsky discusses in her op-ed, basement rocks are only permeable if a fault is present – which obviously doesn’t make for an ideal injection zone. And as Boak recently noted, the seismic energy of all of Oklahoma’s earthquakes since 2009 adds up to the equivalent of just one M-6.1 earthquake; California has had two such 6.1-or-greater quakes since 2014 – with no correlation to oil and gas activities. Though this study is useful in adding to a deeper understanding of induced seismicity, it’s policy implications should be muted by two simple facts: wastewater injection into basement rock is rarely a viable option, and the already small induced seismic risk of wastewater disposal into sedimentary rock is declining due to mitigation measures that address this study’s finding that seismic activity can be triggered at significant distances from injection zones.